Happy Wednesday! 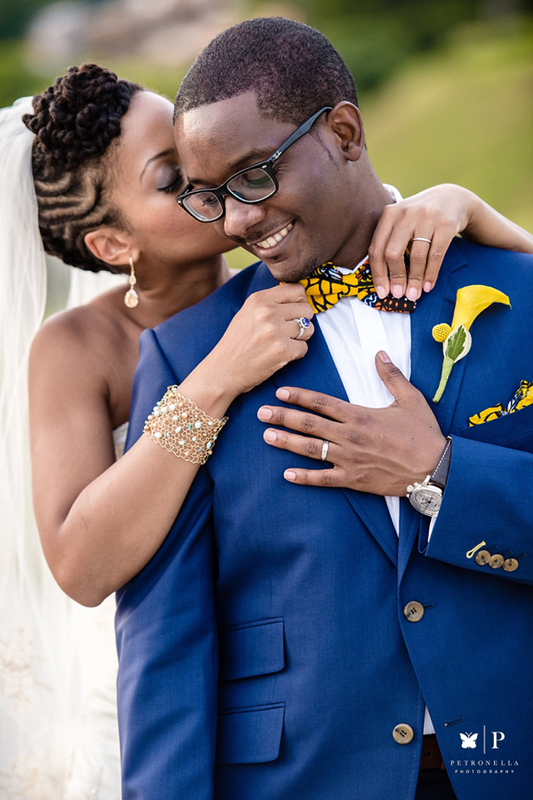 It’s time for our weekly wedding dose from our collaboration from with Munaluchi Bride Magazine. 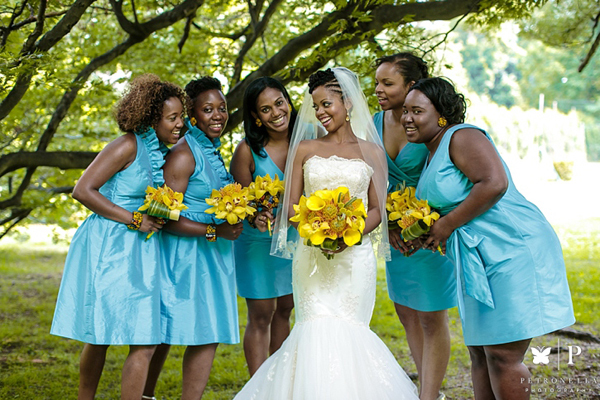 We have such a bright and beautiful Afro-Caribbean wedding in New York – such a beautiful blend of cultures. 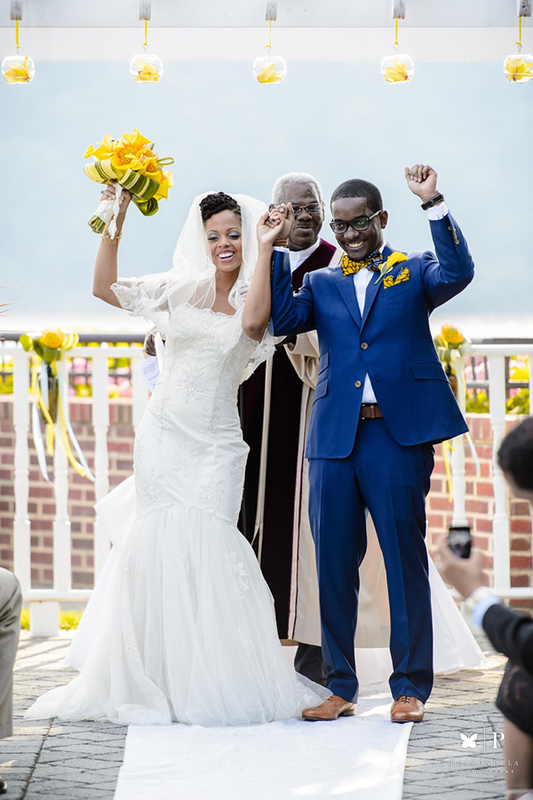 Jerryanne is from Jamaica while Nathan is from Tanzania – the couple planned the wedding with themselves – infusing both their cultures into their intimate celebration. 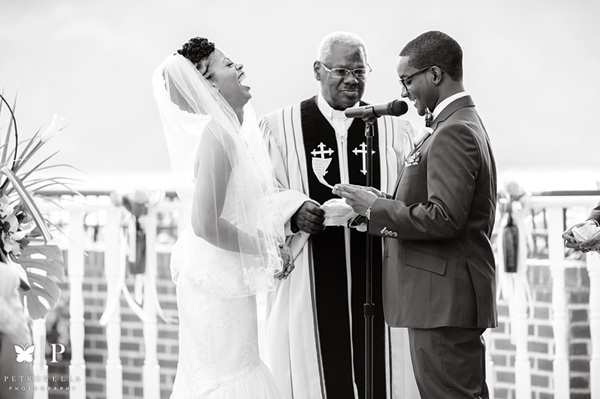 Nathan and I were married on June 21, 2013 – summer solstice and the longest day of the year! We had been engaged for 18 months and we planned the entire wedding ourselves (with support from friends and family). He originally hails from Africa and I from the Caribbean, and we both have family living all over the world. Although we met and live in New York, choosing a wedding location was quite challenging. We wanted our location to reflect the tropical vibes of our birthplaces and give us a blank canvas on which to blend our cultures together. We visited at least 10 venues in the New York area, as well as in Florida (where Nathan lived for two years). 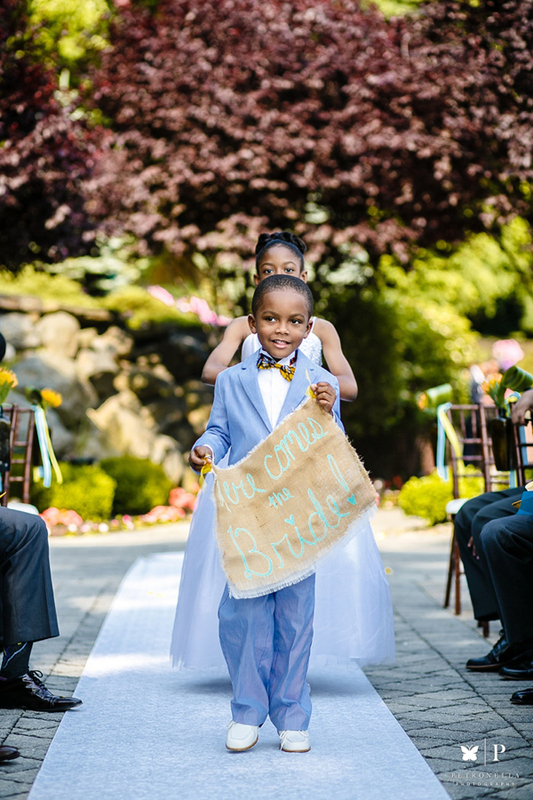 Finally Nathan’s sister found the perfect venue: The Grandview in Poughkeepsie – about two hours away from New York City. 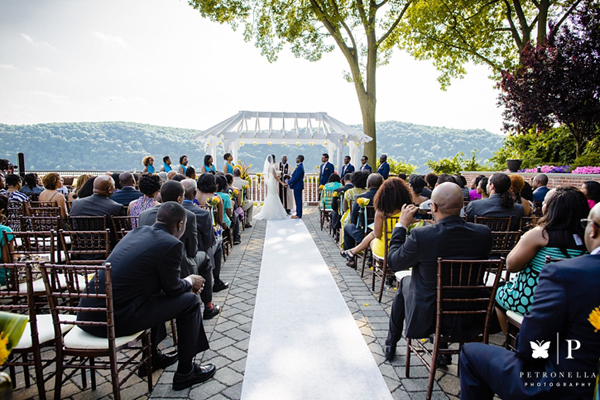 The name “Grandview” is spot on – our ceremony took place outside under a gazebo with a breathtaking view of the Hudson River. 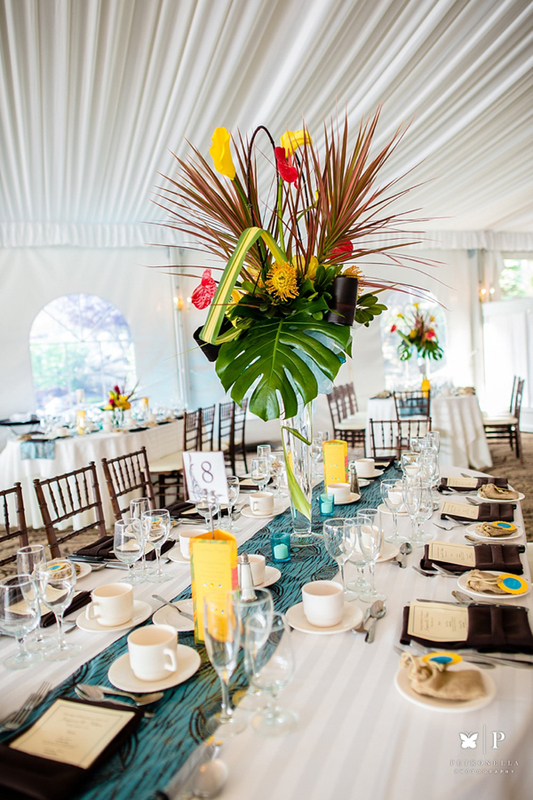 An outdoor tent on the property hosted our reception, giving us the tropical vibe we so wanted. 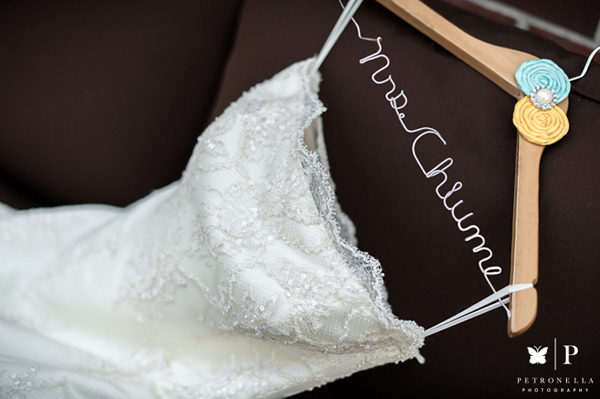 Beyond aesthetic, The Grandview allowed us to personalize nearly every detail of our wedding. They customized our menu and took full direction from us on cuisine from both cultures. To top it off, Mike Post at The Grandview coordinated all of the day-of logistics and provided a bridal attendant who looked after us the entire day. 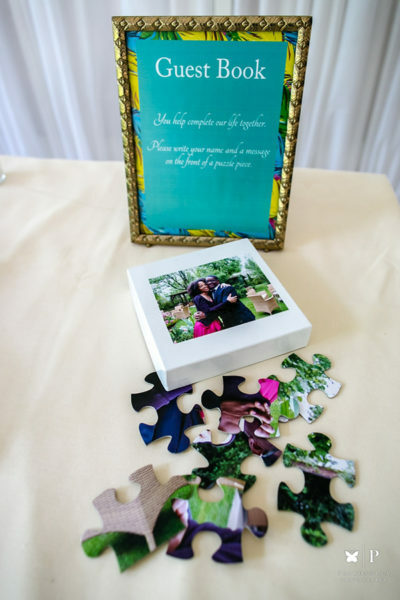 Our wedding day had a lot of personal touches. 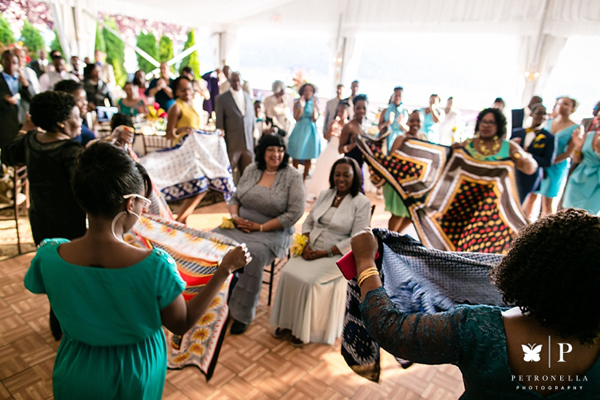 We focused on the most beautiful aspects of our cultures and tried to weave those into our Afro-Caribbean wedding theme. We also took inspiration from small things that many people would otherwise overlook. 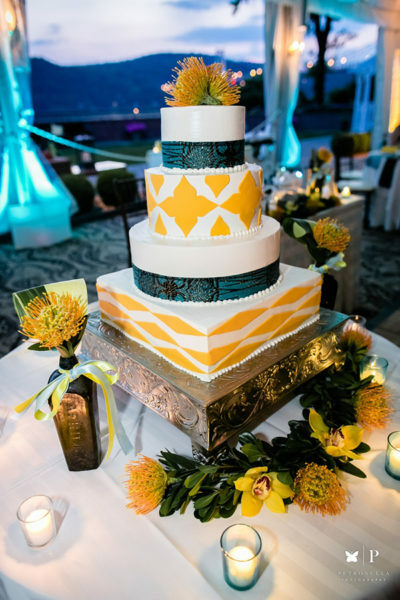 For example, we chose aqua blue and a bold yellow as our wedding colors because they reminded us of the ocean and sun. While visiting Tanzania a year prior to the wedding, we got inspired by the fabrics and handmade crafts we found at the market. 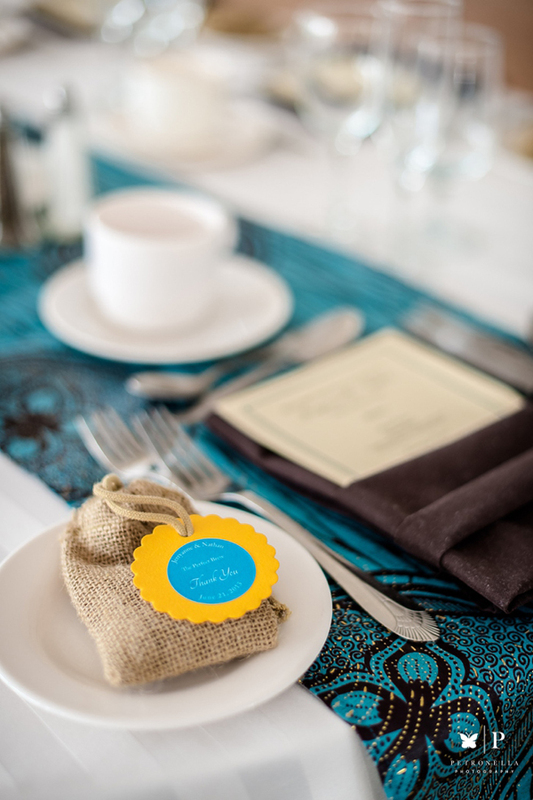 We brought several yards of yellow and blue fabric home and enlisted 3 incredible tailors at AZVKA, Afrikart, and Yara to create our table runners and wedding attendant accessories. During a business trip in Nigeria shortly thereafter, I stumbled upon some vintage African gin bottles that we used as vases during the ceremony. Franz James Floral weaved these gin bottles into our decor alongside the dramatic centerpieces and bouquets they created with some of our favorite exotic flowers. Nathan and I both love music and this was a crucial part of creating the ambience. We brought in a steel pan band for the ceremony that played “Here Comes the Bride” right before I walked down the aisle and during the cocktail hour, and our friends Mao and Dave DJ’d the reception. To highlight my Caribbean culture, I took inspiration from Junkanoo, a traditional carnival held in the Bahamas each year. 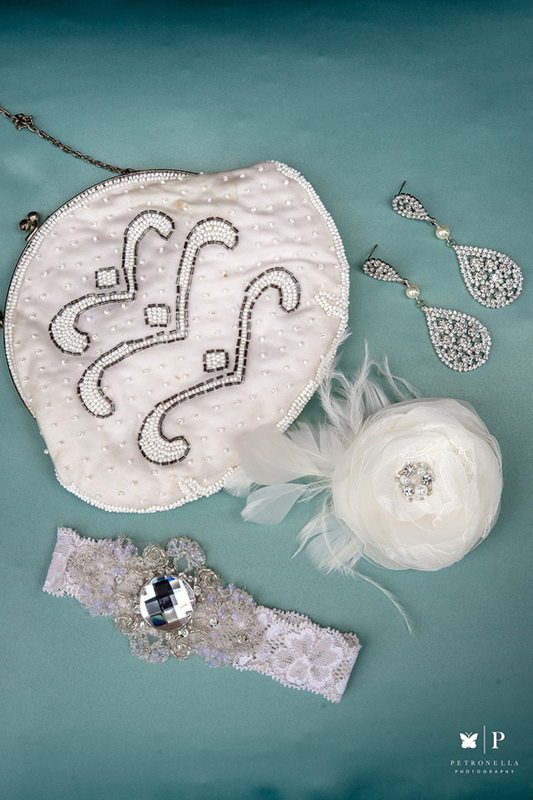 I recalled the brightly colored headpieces covered in sequins, rhinestones, and feathers. I enlisted the help of a friend (Sipiwe Sikwila of Something Me) to create custom stationery for the ceremony programs, reception tables, guest favors, and signage. 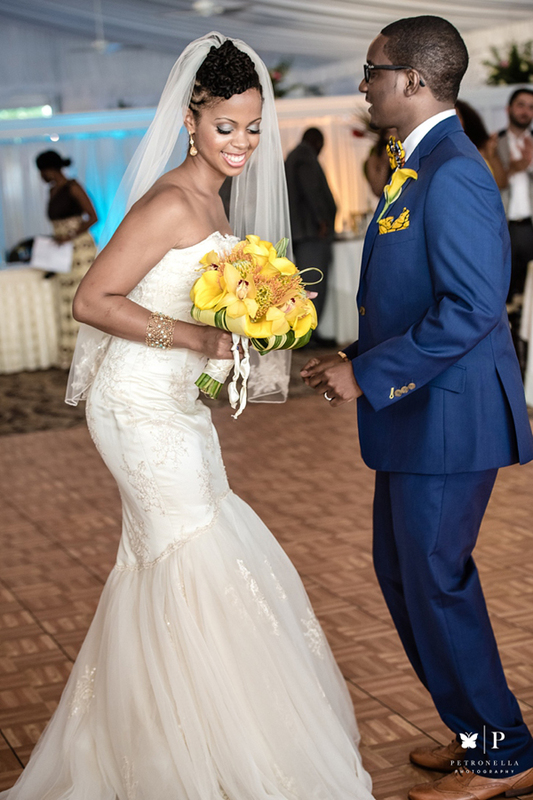 She designed a feather-patterned border for each piece and decorated the ceremony and reception programs with blue and yellow rhinestones. 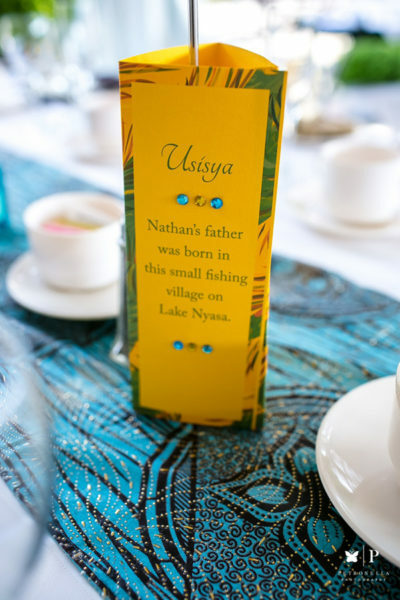 We used another designer at Minted.com to create our festive blue and yellow invitation cards. 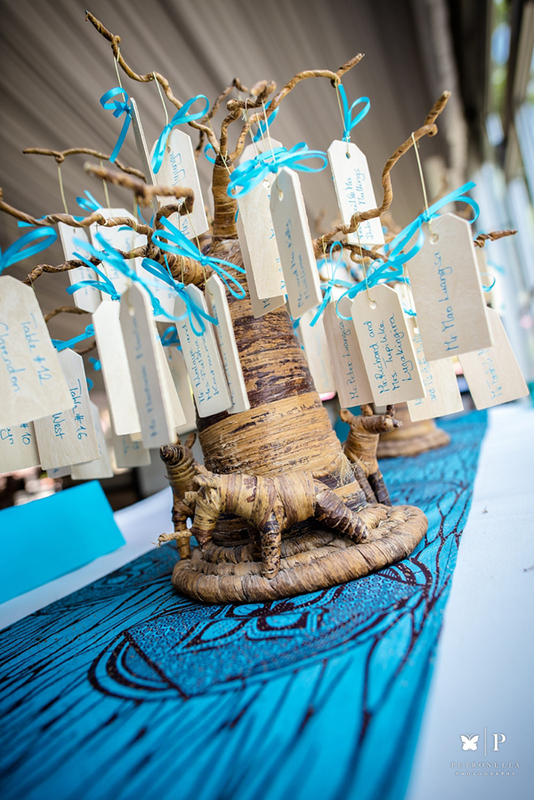 We love weddings as much as you do – get in touch for inquiries, inspiration & more! New Music: Chidinma – Oh Baby! 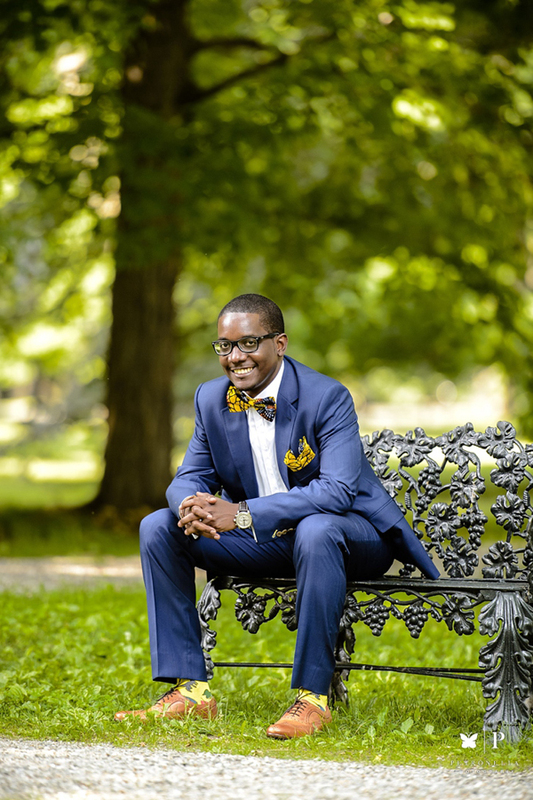 Nice bow tie and pocket square….and cake. 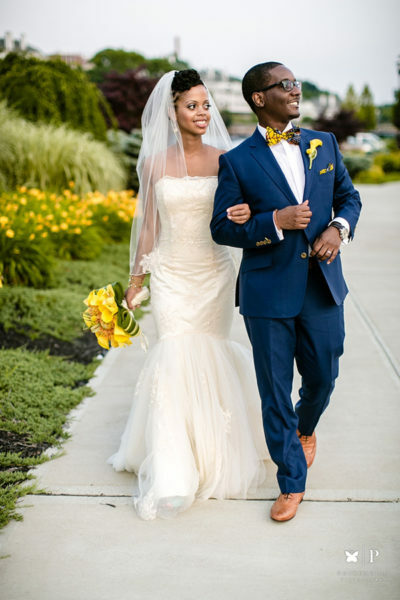 This is a very beautiful & simple wedding. 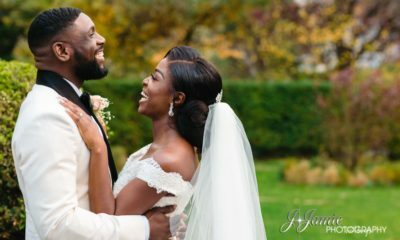 One thing I’ve noticed about weddings by other countries is their simplicity especially when compared to Nigerian weddings which are often times crowded and over the top expensive. You can actually have a beautiful wedding without being lavish. Ah Wunmi I agree with you. Naija! If the bride hasn’t bought Loubs and the groom Gucci, they’ve not arrived. Tent must be from Lagos to Kafanchan and at least 2 hip hop artists in addition to 1 fuji maestro must be on the band stand. Then bride’s friends will have their aso ebi, brides mother’s friends will have another one, grooms mother’s friends will also have a third. I also forgot the groom’s friends and the groom’s dad’s age group. Three different caterers will serve food, and then they won’t serve you if you’re not wearing any of the above mentioned aso ebi lace, ankara or velvet. Oh! I forgot to mention the row of statues, sorry I meant ushers, who line the aisles in the reception and do nothing when you complain you’ve been sitting for 2 hours without being served. Also the waiters with their body odours when they stretch out their hands over your head! While I agree with you on some levels, I think it’s important to distinguish between tradition and extravagance. The Aso Ebi, musicians, inviting lots of people and all that is in our culture. The degree to which it’s executed is what differentiates wedding from wedding. @ Ore, while I agree with you that it’s in “our” culture, it doesn’t mean we have to follow everything in “our” culture especially when it doesn’t make sense or there’s no need for it. There are some aspects to our culture that we can do without. Moreover culture is not static, it evolves. Thank you, Wunmi! You wonder where all the money came from. I swear there ain’t one poor person in Nigeria! I like his socks lol…. Beautiful wedding. Less is more! Perfect, this is class! 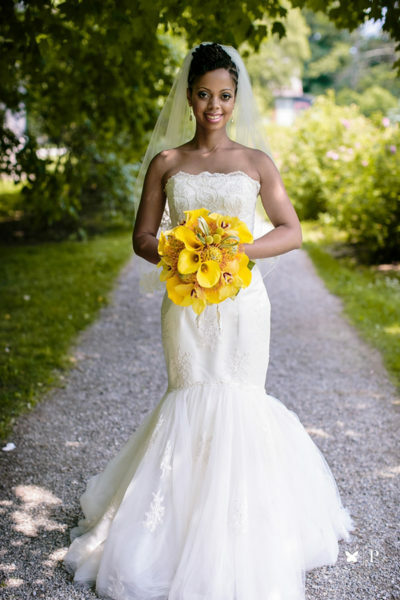 She’s absolutely gorgeous… and I love flowers and the bridal hairstyle. 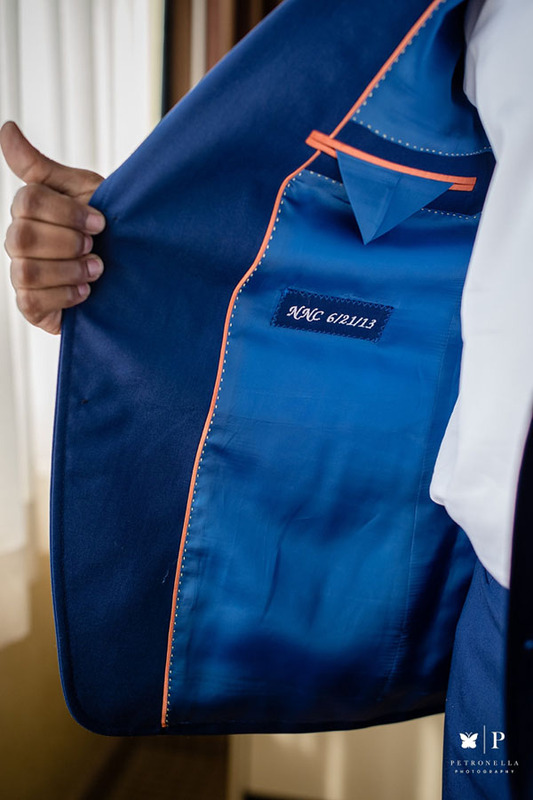 Really digging the groom’s style as well, he made it personal. Wishing the couple a fruitful and happy marriage! Yes to our own Hudson valley … a serene place to come home to after a day’s hustling in the city. Simplicity at its best! And they planned it all by themselves too…now that’s a bargain. Congratulations to both of you. I wish you all the best in life. Lovely. I like the infusion of cultures in the decor. Congrats. Now we know, little can be much. Noooooooooooooooooo is that all BN I was expecting more pishas oh! This is a lovely wedding! Me like! So Beautiful! From the bride, to the flowers to the bow tie to the cake! big it up, sistren. buk buk. Beautiful. The Groom’s attire, bride’s dress, reception was simple yet beautiful. This is not anything money can buy, in church-speak, we call that blessing. It is easy to conclude that Oluwa-was-involved in that union. seems like a fun wedding. 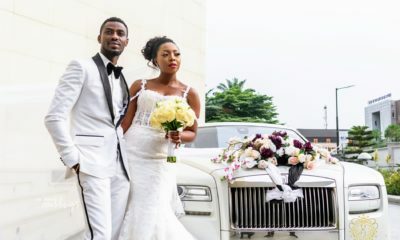 very stylish couple may your marriage be fill with fun and good times always. Beautiful all around!!! LOVES IT! I just love this wedding. 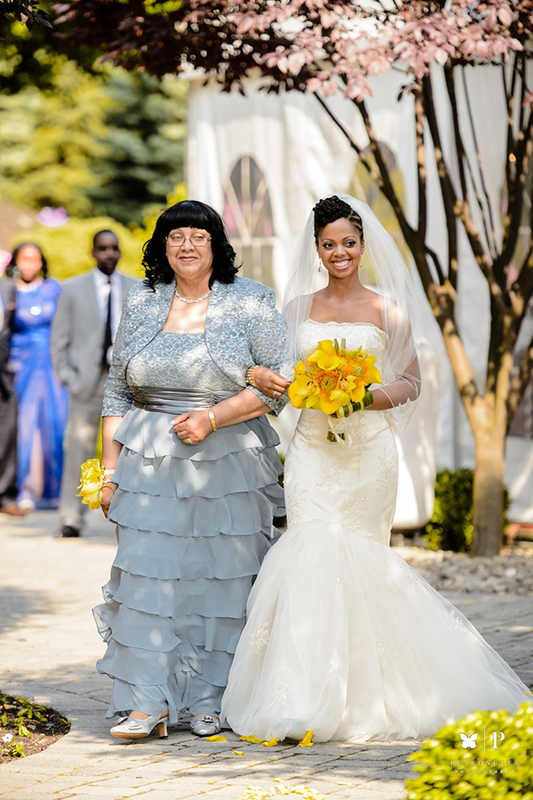 It is a breath of fresh air when compared to our Nigerian weddings that are like expensive carnivals. I like the serene environment where they exchanged their vows. I just love nature and outdoor weddings. The bride is pretty and the groom is handsome. Watching these pictures were really enjoyable to me. i soo love everything traditional abat it. 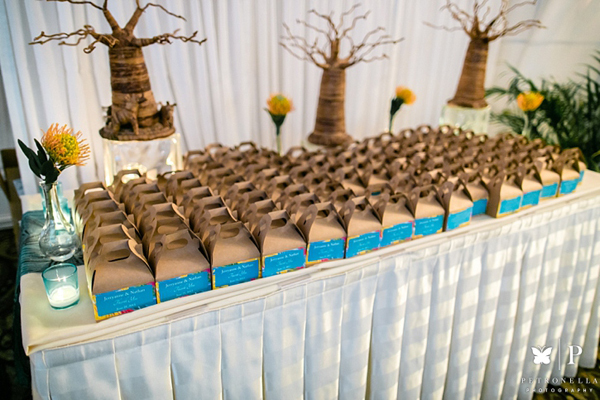 oh not forgetting the Caribbean touches as well. 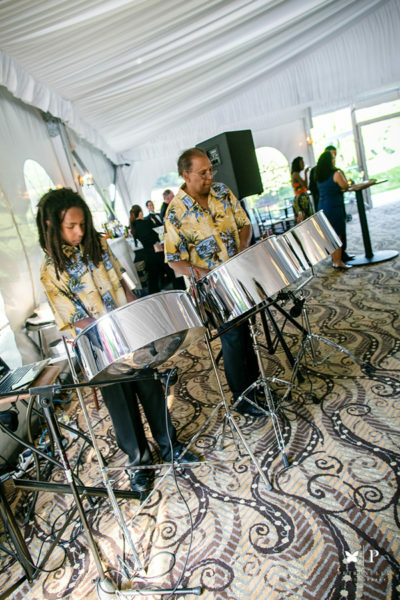 dang saw them steel bands and nice shirts too. 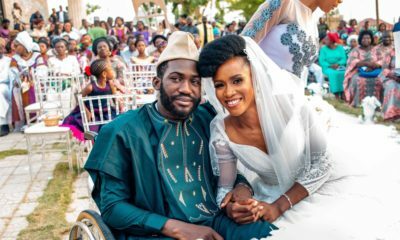 when we learn how not to be upset for not being on the guest list then we would ve weddings just like this in Nigeria.So for all of u wishing to c dis in Nigeria dats ur cue.well if u dont mind not getting invited then be sure to correct ur mum,aunt or any relative when next they make that kind of complain. wow, i like the shade of blue in ur wedding! speechless! 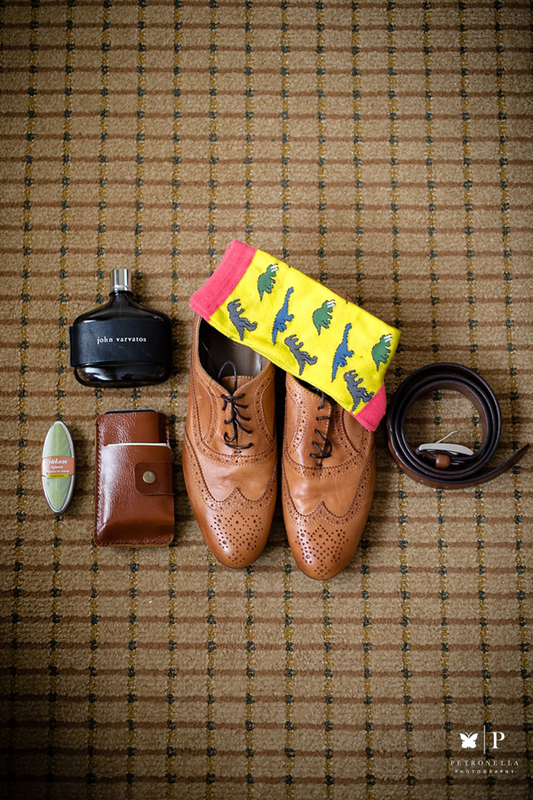 the groom’s socks with dinosaur, so cuuute! i like it! perfect wedding! I so love the wedding! It is perfect. The location is superb. 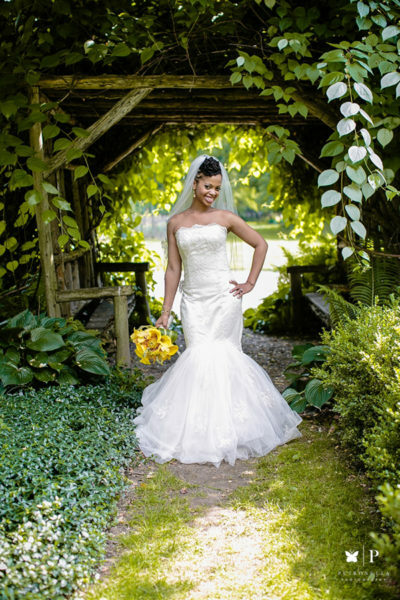 The dress of the bride is elegant and her bouquet is so lovely. And it was such a memorable event, the pictures speak.